July 4, 2014 - Lucas di Grassi records the quickest time during the first two days of official Formula E testing. See the official press release below. Audi Sport Abt’s Lucas di Grassi led the way in the second official test for the all-electric FIA Formula E Championship at Donington Park, setting his best time in the afternoon session to pip yesterday’s pace-setter Sebastien Buemi (e.dams-Renault). Belgian racer Jerome d’Ambrosio, testing for China Racing, topped the morning timesheets with a 1:34.554s and already up on Buemi’s best time from day one. Times then began to tumble partway through the afternoon stint when the temporary chicane on the exit to the Old hairpin was removed after a number of drivers made contact with it. Venturi’s Nick Heidfeld came away with the third best time whilst team-mate Stephane Sarrazin could only manage 13th spot. Scott Speed, testing for Andretti, looked sharp to finish fourth in front of Mahindra’s Bruno Senna and Spain’s Antonio Garcia - testing with China Racing. Nicolas Prost finished ahead of Virgin’s Sam Bird – completing the most laps of any driver with 56 – with d’Ambrosio and Jarno Trulli rounding out the top 10 before rain brought an early end to proceedings with 10 minutes left on the clock. 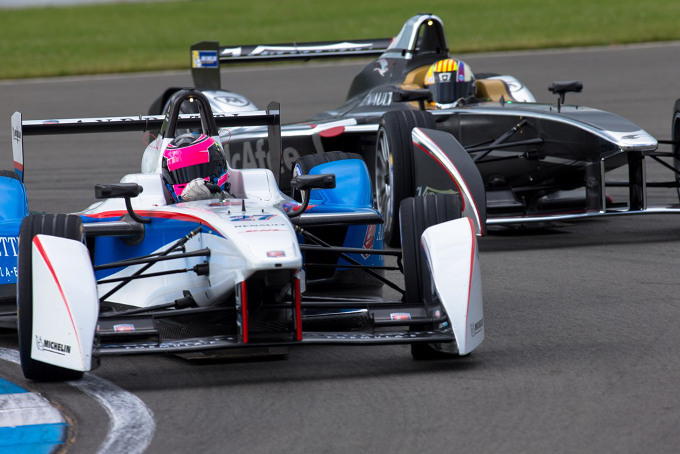 Oriol Servia made his test debut for Dragon Racing alongside newly signed driver Mike Conway. The test day also saw the announcement that pioneering electric car company Rimac Automobili is to supply the series with one of its exclusive fully-electric Concept_One supercars which will be used by the Race Director. The one-of-a-kind car, which can accelerate from 0-60mph in the same time as a Formula E single-seater, also took to the Donington track for a number of demonstration laps. The next test days take place on July 9 and 10 at Donington Park with free access to fans, including a pitlane walk.